The best commuter car for 2015 is the Acura TLX. Choosing a car to spend time on a grueling commute is not simply going to the EPA’s top 10 list. Gas misers are economical commuter cars. They are not great commuter cars unless your idea of a great meal is a container of Top Ramen heated up in a microwave. For this category, I am looking for a reasonably priced five-star restaurant. We think New Car Test Drive was the first to focus on commuting for a product award, though other media quickly glommed on. The mistake most of them make, however, is they focus almost exclusively on fuel economy. (By the way, they don’t commute in those cars personally, they just recommend you do.) If fuel economy is your sole criteria for selecting a car for your daily commute you don’t need them: Simply go to www.fueleconomy.gov and buy your favorite hybrid, that diesel-powered car, your dream electric, or the cheapest, most fuel-efficient subcompact available. Before you do that, though, remind yourself that a two-hour commute means you may spend more than 20 hours a week in your car. Saving fuel has its rewards, but you may not be thinking of that when you’re stuck in an endless stop-and-go. What you need here is comfort and a great audio system. What you need here is your sanity. Likewise, high-performance cars do not make outstanding commuter cars. As a car enthusiast, I love the sound and feel of raw horsepower and the smell of oil and gas. On a race track or for spirited driving, I want sharp handling, excellent transient response, abundant torque and fade-free brakes. But for commuting to work through heavy traffic, I don’t need all that. High performance brings trade-offs; sometimes those trade-offs are minimized but they’re still there. When commuting to and from work doppio in hand, I want a smooth ride and a quiet cabin. I want responsiveness from the engine compartment for making that quick pass, but it needs to be smooth power. I want precision from the engine and precision from the brakes, so that I can make smooth adjustments in traffic that don’t upset my quiet cabin. The 2015 Acura TLX checks all my commuter boxes with a bold Sharpie. All-new, the 2015 TLX is an outstanding sedan in every respect. Its smooth ride, smooth, responsive powertrain, smooth brakes, comfortable cabin, and easy to use features make it a joyous refuge from the daily grind. It’s very quiet underway and the audio system is wonderful. Those are the qualities of a great commuter car. Let us count the ways. 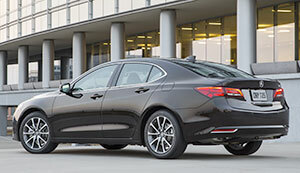 First, the TLX is a four-door sedan. When you’re running out of the house a bit later than planned or at the end of a long day and you’re carrying way too much work-related stuff to and fro, you simply open the rear passenger door on the driver’s side and pile it onto the back seat. Ditto with your wet raincoat, ditto with your dry cleaning. Any of that is more awkward with a coupe. Also, getting in and out of a midsize four-door sedan such as the TLX is easy. Easy is good when going to and from work and when making quick stops along the way. Those stops along the way are always quick because you’re trying to get to work or trying to beat traffic home. It’s not so small it’s uncomfortable and it’s not so large it’s hard to park. Now, ease into the TLX cabin. It’s an attractive place to spend a grueling, two-hour commute. As Gary Witzenburg described in our NewCarTestDrive.com review, the premium-look soft-touch instrument panel and door panels are complimented by tasteful, authentic-looking woodgrain and aluminum accents, while handsome leatherette trim is standard and Milano leather available. The seats in both the TLX 2.4L and TLX 3.5L offer fatigue-free comfort and support and are heated and ventilated. The manual steering column tilts and telescopes. There’s ample room and comfort for four (with room for five) adults, should you make the mistake of car pooling or need your commuter for other aspects of your miserable, overworked, overstressed life. GPS-linked automatic climate control means you can set it and forget it, no messing around with temperature knobs and fan switches. All-new, the 2015 Acura TLX is loaded with technology to coddle you, entertain you, to keep you connected, and to keep you safe. Available features include Bluetooth HandsFreeLink, 3D Navigation and AcuraLink Real-Time Traffic with Traffic Rerouting, a color Multi-Information Display with turn-by-turn guidance, LED accent lighting so you can monitor the paperwork you threw in the passenger-side footwell, HD Radio, Pandora and Aha integration, HDMI and USB connectivity. The latest-generation AcuraLink cloud-based connected car system is there, enabling a broad range of cloud-based and embedded convenience, connectivity and security features. A seven-inch touch-screen displays and controls many features, and it’s easy to see and use. The Multi-Information Display sits above the touch screen in a hooded recess. The big upper navigation screen and the touch-screen controls below are intuitive and easy to use even while on the move. There are hard buttons for key climate and entertainment system functions and a much-appreciated volume knob, though unhappily not one for tuning. Most important for commuting is the brilliant Acura/ELS 10-speaker Studio Premium Audio system (part of the Advance Package, which you should order). Once underway, you can use adaptive cruise, lane keeping or other driver assistance and safety systems or you can turn them off. 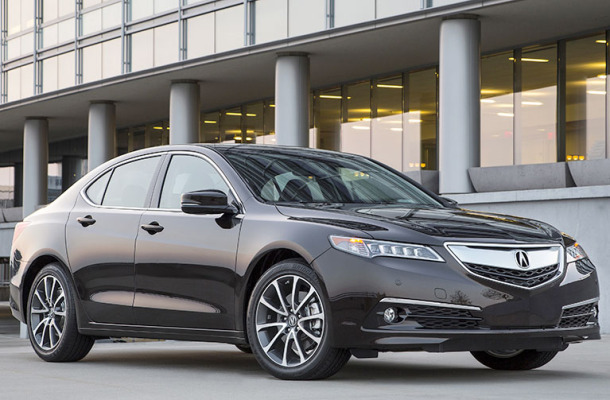 The 2015 Acura TLX comes in three versions, with several option packages. You cannot go wrong, but it’s worth spending time choosing carefully; you’ll want to consider the Technology Package and the Advance Package. Prices range from an MSRP of $30,995 for the TLX 2.4L or $35,025 with the Technology Package to $35,220 for the TLX 3.5L or $42,500 with the Technology and Advance packages or $44,700 for a loaded all-wheel-drive TLX 3.5L SH-AWD. Two engines are available, both of which are smooth and responsive. The TLX 2.4L is powered by a 2.4-liter four-cylinder engine that delivers strong mid-range torque and smoothly winds to its 7000-rpm redline with joy. The TLX 3.5L is powered by a 3.5-liter V6 engine, which delivers more power and is a bit more fun when driving aggressively. The V6 is a little smoother and its additional torque makes it a bit more responsive and easier in heavy traffic, and its 9-speed automatic is a paragon of smoothness. The 2.4L is almost as good, however, and gets better fuel economy. It comes with an 8-speed dual-clutch transmission, which works very well. Ah, fuel economy. While we dissed its importance, you don’t need a shale deposit in your backyard to keep a TLX rolling. The 2015 TLX 2.4L is EPA-rated at 24/35 mpg City/Highway, or 28 mpg Combined. The 2015 3.5L is EPA-rated at 21/34 mpg City/Highway, or 25 mpg Combined. Premium gasoline is recommended for both models. 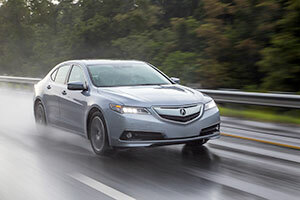 We’d choose the TLX 2.4L, unless we lived in the Snow Belt, in which case we’d spring for a TLX 3.5L SH-AWD. TLX is based on front-wheel drive and its P-AWS all-wheel-steer system improves handling response and agility and reduces understeer, the former important for emergency maneuvers, the latter useful when squealing around an on-ramp for entertainment. Loaded with more technology than we have space to cover, this car is both smooth and sharp on winding roads and very stable at high speeds. Vehicle Stability Assist helps the front-wheel-drive TLX manage wintry conditions. If snow is part of your commute, I recommend the SH-AWD all-wheel drive. Stability and traction are both enhanced in ice and snow, reducing the chance of biting the ditch or plowing into a parked car. Order a second set of wheels and buy some good snow tires from the Tire Rack or your local retailer. So, stop at Starbucks, pick up your cappuccino and one of their breakfast sandwiches, and enjoy the commute in your Acura TLX. You’ve earned it.